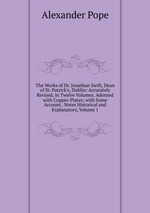 Аннотация к книге "The Works of Dr. Jonathan Swift, Dean of St. Patrick`s, Dublin: Accurately Revised, in Twelve Volumes. Adorned with Copper-Plates; with Some Account . Notes Historical and Explanatory, Volume 1"